It is time for a market update for the most popular neighborhood in Tallahassee, Killearn Estates. We are excited to announce that Alex Nunez has just finished the work on the Killearn Estates Neighborhood Page, I hope you'll visit it and let us know what you think. 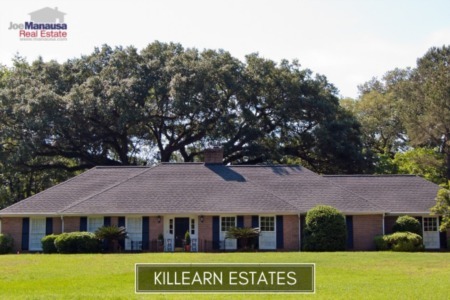 If you have a home (or want a home) in Killearn Estates, I recommend you bookmark that page and revisit it often. The homes for sale and past sales will be updated on a regular basis. You'll note (if you visit) that all homes sold in Killearn Estates from January 1991 through May 2015 are listed at the bottom of the page (more than 5,000 home sales!) and can be searched and sorted (for those of you who want to know past sales information). 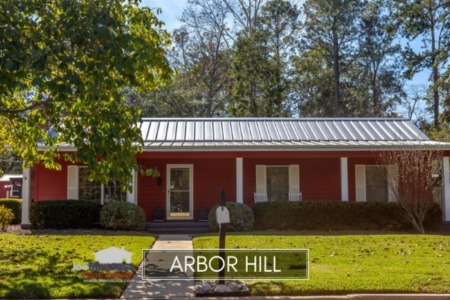 Home construction in Killearn Estates began in the 1960s and continues sporadically through today, though most of the building was completed more than 10 years ago. This means that there are plenty of great values (a lot of home for the money). Additionally, opportunities for buying and upgrading older homes on mature lots are an option for those wanting a newer home without the higher costs of building new today. For the three real estate graphs found in this report, you will find the number of closed home sales for each year (red columns, measured on the left vertical axis), and an important real estate statistic shown in blue (measured on the right vertical axis. It is important to note that sales are through December for all previous years, but through May in 2015. Average home prices have risen 7.5% thus far in 2015 versus last year, moving from $211,700 to $227,700. Prices have recovered 14% since the bottom of the market was reached in 2012, but still remain 19% lower than the market peak of $280,500 that was recorded for the 2006 calendar year. Home sales activity in 2014 was the best of the past 8 years, but still well below the levels recorded during the most active years from 1992 through 2005. There have been 62 closed home sales in Killearn Estates in 2015, representing a pace that remains far lower than the standard established in the 1990s. Average home values in Killearn Estates have not changed much in the past two years. They have gone from an average of $105 per square foot in 2013, down to $103 per square foot in 2014, and then up to $104 per square foot thus far in 2015. Home values remain 24% below the the averages recorded in the best year on record (2006) but up 9% over the worst year (2012). These values suggest that many homeowners who have purchased or refinanced in the past 10 years are still going to be dealing with negative equity positions and will need creative solutions for selling their homes today. The average home size sold in Killearn Estates typically falls in a range of 1,900 to 2,200 square feet, and this year buyers are shooting for the top of this range. The 62 homes sold in 2015 have averaged 2,177 square feet, which fully explains how the average sales price is going higher all the while home values are not moving much at all. The following map of homes are the most recent listings in Killearn Estates. Note that the map is shown in several layers due to the large amount of homes featured. Simply click on the "next" link to see them all. I hope you enjoyed our May 2015 update on home sales in Killearn Estates, please feel free to drop me a note if you have questions not covered in this report.